This residential development has made the mistake of removing all of the riverbank vegetation. Not only does this practice degrade water quality, it causes severe bank erosion problems for the homeowners. 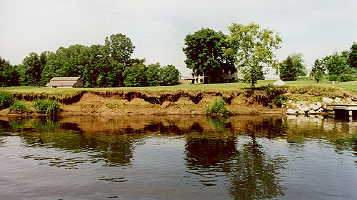 The placement of stones along the bank is an attempt to stabilize the erosion. A permit is required from the Michigan DEQ before one can legally place such structures on a stream or riverbank. Further downstream, the problems are even worse. The landowners would not have created this severe erosion if they had left the natural riparian buffers in place. Replanting the banks would go a long way toward stabilizing the soils for these homeowners. Shade for the banks would also cool the water and lead to a healthier stretch of river here. Bank vegetation tends to keep banks stable. Those roots really hang on to the soil during times of heavy water flow. It is always amazing to see what people will throw into a river. 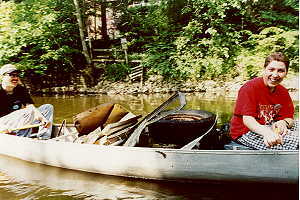 It would be nice if some day we could do a river cleanup and not find objects such as these. 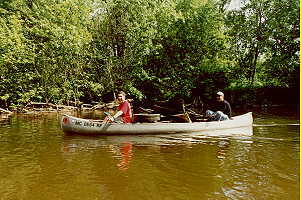 Mike and Ben, from Holt, Michigan, "cleaned up" in the competition by winning the "Most amount of trash in one canoe" award, tied with another father/son team. 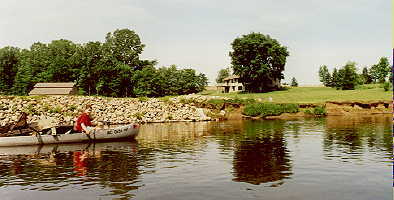 In the background, a residence has rock-stabilized banks and nicely shaded riparian vegetation.